"VVD" redirects here. For the Dutch footballer nicknamed as "VVD", see Virgil van Dijk. The People's Party for Freedom and Democracy (Dutch: Volkspartij voor Vrijheid en Democratie, VVD; Dutch pronunciation: [vɔl(ə)kspɑrtɛi voːr vrɛiɦɛit ɛn deːmoːkraːˈtsi]) is a conservative-liberal political party in the Netherlands. The VVD, whose forerunner was the Freedom Party, supports private enterprise and economic liberalism. 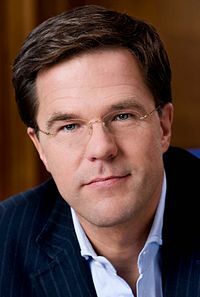 Mark Rutte has been the party's leader since 31 May 2006 and on 14 October 2010 became Prime Minister of the Netherlands, marking the first time that the VVD led a government. The First Rutte cabinet's parliamentary majority was provided by the Christian Democratic Appeal and the Party for Freedom, but this majority became unstable when the latter refused to support austerity measures amid the Euro crisis. Therefore, a general election was held in September 2012. The VVD remained the largest party, with 41 seats. From November 2012 until March 2017, the VVD was the senior partner in the Second Rutte cabinet, a "purple" coalition government with the Labour Party. VVD remained the largest party in the March 2017 election (though was reduced to 33 seats); therefore, Rutte was expected to remain as Prime Minister. However, continuing the existing coalition was impossible, as the Labour Party had lost 29 seats, therefore a centre-right coalition was negotiated with the D66, CU and CDA, which became the Third Rutte Cabinet. The VVD was founded in 1948 as a continuation of the Freedom Party, which was a continuation of the interbellum Liberal State Party, which in turn was a continuation of Liberal Union. They were joined by the Comité-Oud, a group of liberal members of the Labour Party (PvdA), led by Pieter Oud. The liberals within the Labour Party were primarily members of the pre-war social liberal Free-thinking Democratic League (VDB), who went on to join the Labour Party in the post-war Doorbraak ("Breakthrough") movement. However, they believed that the Labour Party was becoming too socialist for their liking. Oud became the merged party's first leader. 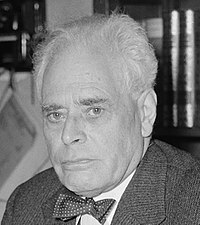 Between 1948 and 1952 the VVD took part in the broad cabinets led by the Labour Party Prime Minister Willem Drees. The party was a junior partner with only eight seats to the Catholic People's Party (KVP) and Labour Party, which both had around thirty seats (out of 100). The Drees cabinets laid the foundation for the welfare state and decolonisation of the Dutch East Indies. In the Dutch general election of 1952 the VVD gained one seat, but did not join the government. In the Dutch general election of 1956 they increased their total, receiving thirteen seats, but were still kept out of government until the general election of 1959, which was held early because of cabinet crisis. This time they gained nineteen seats and the party entered government alongside the Protestant Anti-Revolutionary Party (ARP), Christian Historical Union CHU and the Roman Catholic KVP. In 1963, Oud retired from politics, and was succeeded by the Minister of the Interior Edzo Toxopeus. With Toxopeus as its Leader, the VVD lost three seats in the 1963 election, but remained in government. In 1962, a substantial group of disillusioned VVD-members founded the Liberal Democratic Centre (Liberaal Democratisch Centrum, LDC) which was intended to introduce a more twentieth-century liberal direction pointing to the classical liberal VVD. In 1966, frustrated with their hopeless efforts, LDC members departed the VVD altogether and went on now to form an entirely political party, the Democrats 66 (D66). In 1965, there also occurred a conflict between VVD Ministers and their counterparts from the KVP and ARP in the Marijnen cabinet. The cabinet fell and without an election it was replaced by the KVP–ARP–PvdA cabinet under Jo Cals, which itself also fell the next year. In the following 1967 election the VVD remained relatively stable and entered yet again the cabinet under Prime Minister Piet de Jong. During this period the VVD had loose ties with other liberal organisations and together they formed the neutral pillar. This included the liberal papers Nieuwe Rotterdamsche Courant and Algemeen Handelsblad, the broadcaster AVRO and the employers' organisation VNO. In the Dutch general election of 1971 the VVD lost one seat and the cabinet lost its majority. A cabinet was formed by the Christian democratic parties, the VVD and the Labour Party offshoot Democratic Socialists '70. This cabinet collapsed after a few months. Meanwhile, the charismatic young MP Hans Wiegel had attracted considerable attention. He became the new leader of the VVD: in 1971 he became the new parliamentary leader, and in 1972 he was appointed lijsttrekker. Under Wiegel's leadership, the party oriented towards a new political course, reforming the welfare state, cutting taxes etc. Wiegel did not shrink from conflict with the Labour Party and the trade unions. With this new course came a new electorate: working class and middle-class voters who, because of individualisation and depillarisation, were more easy to attract. The course proved to be profitable: in the heavily polarised general election of 1972 the VVD gained six seats. The VVD was kept out of government by the social democratic and Christian democratic cabinet led by Joop den Uyl. Although the ties between the VVD and other organisations within the neutral pillar became ever looser, the number of neutral organisations, friendly to the VVD, expanded. The TROS and later Veronica, new broadcasters which entered the Netherlands Public Broadcasting, were friendly to the VVD. In 1977 the VVD again won six seats bringing its total to twenty-eight seats. When lengthy formation talks between the social democrats and Christian democrats eventually led to a final break between the two parties, the VVD formed cabinet with the Christian Democratic Appeal (CDA), with a majority of only two seats. In the general election of 1981 the VVD lost two seats and its partner the CDA lost even more. The cabinet was without a majority and a CDA, Labour and D66 cabinet was formed, falling after only a few months. In 1982 Hans Wiegel left Parliament to become Queen's Commissioner in Friesland and was succeeded by Ed Nijpels. In the general election of 1982 Nijpels' VVD gained ten seats, bringing its total up to 36. Once again, it formed a cabinet with the CDA under CDA Leader Ruud Lubbers. The cabinet began a programme of radical reform of the welfare state, which is still in place today. The VVD lost nine seats in the 1986 election but the cabinet nonetheless retained its majority. The losses were blamed on Nijpels, who stood down as leader of the VVD. He was succeeded by Joris Voorhoeve. In 1989 the CDA–VVD cabinet fell over a minor issue, and the VVD lost five seats in the subsequent election, leaving only twenty-two. The VVD was kept out of government, and Voorhoeve stood down and was succeeded by the charismatic intellectual Frits Bolkestein. Bolkestein's VVD was one of the winners of the Dutch general election of 1994: the party gained nine seats. It formed an unprecedented government with the Labour Party (PvdA) and the social liberal Democrats 66. The so-called "purple cabinet" led by Wim Kok was the first Dutch government without any Christian parties since 1918. Like many of his predecessors, Bolkestein remained in parliament. His political style was characterised by some as "opposition to one's own government". This style was very successful and the VVD gained another seven seats in the 1998 election, becoming the second largest party in parliament with thirty-eight seats. The VVD formed a second Purple cabinet with the Labour Party and D66. Bolkestein left Dutch politics in 1999 to become European Commissioner. He was replaced by the more technocratic and social liberal Hans Dijkstal. In the heavily polarised Dutch general election of 2002, dominated by the rise and murder of Pim Fortuyn, the VVD lost fourteen seats, leaving only twenty-four. The VVD nonetheless entered a cabinet with the Christian Democratic Appeal and the Pim Fortuyn List (LPF). Dijkstal stood down and was replaced by the popular former Minister of Finance Gerrit Zalm. After a few months, Zalm "pulled the plug" on the First Balkenende cabinet, after infighting between Pim Fortuyn List ministers Eduard Bomhoff and Herman Heinsbroek. In the subsequent general election of 2003, the VVD with Gerrit Zalm as lijsttrekker gained four seats, making a total of twenty-eight. The party had expected to do much better, having adopted most of Fortuyn's proposals on immigration and integration. The VVD unwillingly entered the Second Balkenende cabinet with Zalm returning as Minister of Finance and as Deputy Prime Minister. On 2 September 2004, Geert Wilders, a Member of the House of Representatives, left the party after a dispute with Parliamentary leader Van Aartsen. He chose to continue as an Independent in the House of Representatives. 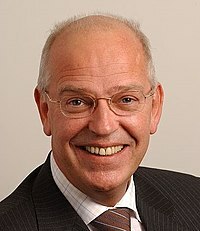 On 27 November 2004 Gerrit Zalm was succeeded as Leader by the Parliamentary leader of the VVD in the House of Representatives Jozias van Aartsen. In 2006 the party lost a considerable number of seats in the municipal elections, prompting parliamentary leader Jozias van Aartsen to step down. Willibrord van Beek was subsequently appointed parliamentary leader ad interim. In the subsequent party leadership run-off Mark Rutte was elected as the leader, defeating Rita Verdonk and Jelleke Veenendaal. The general election of 2006 did not start off well for the VVD: Mark Rutte was criticised by his own parliamentary party for being invisible in the campaign, and he was unable to break the attention away from the duel between current Christian democratic Prime Minister Jan Peter Balkenende and Wouter Bos of the Labour Party. However, the VVD's campaign started relatively late. The election polls showed losses for the VVD; the former VVD deputy Prime Minister Hans Wiegel blamed a poor VVD campaign for this, caused by the heavily contested VVD leadership run-off between Mark Rutte and Rita Verdonk earlier in the year. Verdonk had her eyes on the deputy-minister post, while cabinet posts are normally decided upon by the political leader of the VVD. On election day, the party received enough votes for twenty-two seats, a loss of six seats. When the official election results were announced on Monday 27 November 2006, preferential votes became known as well, showing that Rita Verdonk, the second candidate on the list, had obtained more votes than the VVD's top candidate, Mark Rutte. Rutte had received 553,200 votes, while Verdonk had received 620,555. This led Verdonk to call for a party commission that would investigate the party leadership position, as a consequence of the situation of her obtaining more votes in the general election than Rutte, creating a short-lived crisis in the party. A crisis was averted when Rutte called for an ultimatum on his leadership, which Verdonk had to reconcile to, by rejecting her proposal for a party commission. During 2007, signs of VVD infighting continued to play in the media. In June 2007, the former VVD minister Dekker presented a report on the previous election, showing that the VVD lacked clear leadership roles, however the report did not single out individuals for blame for the party's losses. After Verdonk renewed her criticism of the party in September 2007, she was expelled from the parliamentary faction, and subsequently relinquished her membership of the party, after reconciliation attempts had proven futile. Verdonk started her own political movement, Proud of the Netherlands, subsequently. In opinion polls held after Verdonk's exit, the VVD was set to lose close to ten parliamentary seats in the next election. Jan van Zanen, chairman of the VVD's party board, announced in November 2007 that he would step down in May 2008, a year before his term would end. The rest of the board also announced that they would step down. On the same day of his announcement, honorary member Hans Wiegel called for the resignation of the board, because it could not keep Verdonk in the party. Wiegel also opined that the VVD should become part of a larger liberal movement, that would encompass the social liberals Democrats 66, the Party for Freedom of Geert Wilders and Rita Verdonk's Proud of the Netherlands movement, although he found little resonance for this ideas from others. In 2008, the VVD chose a new party chairman, Ivo Opstelten, the outgoing mayor of Rotterdam. Mark Rutte announced at the celebration of the party's sixth decennial that he would rewrite the foundational programme of the party that was enacted in the early 1980s, and offer the new principles for consideration by the party's members in the fall congress. After the Dutch general election of 2010 the VVD became the largest party with 31 seats and was the senior party in a centre-right minority First Rutte cabinet with the Christian Democratic Appeal supported by the Party for Freedom of Geert Wilders to obtain a majority. Rutte was sworn in as Prime Minister on 21 October 2010, becoming both the first VVD Prime Minister ever, and the first liberal to hold the office in 92 years. However, on 21 April 2012, after failed negotiations with the Party for Freedom on renewed budget cuts, the government became unstable and Mark Rutte deemed it likely that a new election would be held in 2012. On election day, 12 September 2012, the VVD remained the largest party in Parliament, winning 41 seats, a gain of 10 seats. After the 2012 general election the VVD entered into a ruling coalition with the Labour Party as their junior coalition partner. This coalition lasted a full term, but lost its majority at the 2017 election; the VVD itself lost eight seats, though remained the largest party with 33. The VVD was originally a merger of the Party of Freedom and Freethinking Democratic dissenters within the Labour Party. In this name, both tendencies, classical liberalism ("Freedom") and social liberalism ("People's Party"; "Democracy") are represented. Despite being a liberal party, the VVD did not openly call itself "liberal", mainly because of the for some still lingering negative connotations of liberalism developed during the Great Depression and World War II. The most common English translation of the name is the literal translation, People's Party for Freedom and Democracy. The VVD is a party founded on liberal philosophy, traditionally being the most ardent supporter of 'free markets' of all Dutch political parties, promoting political, economic liberalism, classical liberalism, cultural liberalism, but also (in contrast to this) committed to the idea of the welfare state. Post 1971, the party became more populist, although some conservative liberal elements remain. The 2006 leadership election was interpreted by many as a conflict between a liberal group and a conservative group within the VVD, with the distinctly liberal Rutte beating conservative Verdonk. The results were, with 52% voting for Rutte and 46% for Verdonk. The principles of the People's Party for Freedom and Democracy are outlined in the "Liberal Manifesto" (Liberaal Manifest) and the election programmes. The Liberal Manifesto is a general outlook on the direction of the party would like to mirror itself and is an extension of the party's foundational principles. The election programmes are more oriented to practical politics, for example, winning the elections on-the-day and by any means possible. The Manifesto calls for a directly elected Prime Minister, whereby voters could express their preference on the ballot. The question of (advisory) referendums is not favourable. Mayors should be directly elected by the people. Commitment to the Four Freedoms of the European Single Market. A common policy on defence and security in the European Union is called for. The principle of non-discrimination should be given more importance than the exercise of religion. "Social rights" are to be continued. These are not simply rights, but they also create obligations. Euthanasia is part of a person's right to self-determination. Commitment to an open economy, with a "regulated free-market", including patents. Support for the freedom of contract. No right for workers to enter into nationally binding collective bargaining agreements. Minimise the option of dual citizenship. Social security should only be fully open for Dutch nationals. Migrants would have to integrate in order to become citizens. The MEPs of the People's Party for Freedom and Democracy are part of the Alliance of Liberals and Democrats for Europe Party and Alliance of Liberals and Democrats for Europe Group in the European parliament. The VVD provides four out of twelve King's Commissioners. The VVD is part of every college of the Provincial-Executives Gedeputeerde Staten except for Friesland. In the following figure one can see the election results of the provincial elections of 2003, 2007, 2011 and 2015 per province. It shows the areas where the VVD is strong, namely the Randstad urban area that consists out of the provinces North and South Holland, Utrecht and (parts of) Flevoland. The party is weak in peripheral provinces like Friesland, Overijssel, Zeeland, and Limburg. 119 of the 380 Dutch Mayors are member of the VVD since 2018. Furthermore, the party has about 250 aldermen and 1100 members of municipal councils. The VVD provides the mayors of several major cities like; the Mayor of The Hague Pauline Krikke, the Mayor of Utrecht Jan van Zanen, the Mayor of Eindhoven John Jorritsma and the Mayor of Tilburg Theo Weterings. Historically the VVD electorate consisted mainly of secular middle-class and upper-class voters, with a strong support from entrepreneurs. Under the leadership of Wiegel, the VVD started to expand its appeal to working class voters. The highest organ of the VVD is the General Assembly, in which all members present have a single vote. It convenes usually twice every year. It appoints the party board and decides on the party programme. The order of the First Chamber, Second Chamber and European Parliament candidates list is decided by a referendum under all members voting by internet, phone or mail. If contested, the lijsttrekker of a candidates lists is appointed in a separate referendum in advance. Since 2002 the General Assembly can call for a referendum on other subjects too. The present chairman of the board was elected this way. About 90 members elected by the members in meetings of the regional branches form the Party Council, which advises the Party Board in the months that the General Assembly does not convene. This is an important forum within the party. The party board handles the daily affairs of the party. The independent youth organisation that has a partnership agreement with the VVD is the Youth Organisation Freedom and Democracy (Jongeren Organisatie Vrijheid en Democratie, JOVD), which is a member of the Liberal Youth Movement of the European Union and the International Federation of Liberal and Radical Youth. The education institute of the VVD is the Haya van Someren Foundation. The Telders Foundation is the party's scientific institute and publishes the magazine Liberaal Reveil every two months. The party published the magazine Liber bi-monthly. The VVD is a member of the Alliance of Liberals and Democrats for Europe Party and Liberal International. The VVD has always been a very independent party. The VVD cooperates on the European and the international level with the social liberal Democraten 66. It has a long history of coalitions with the Christian Democratic Appeal and its Christian democratic predecessors, but was in government with the social democratic Labour Party from 1994 to 2002 and again between 2012 and 2017. The VVD participates in the Netherlands Institute for Multiparty Democracy, a democracy assistance organisation of seven Dutch political parties. ^ Sean Lusk; Nick Birks (2014). Rethinking Public Strategy. Palgrave Macmillan. p. 168. ISBN 978-1-137-37758-6. ^ Rudy W Andeweg; Lieven De Winter; Patrick Dumont (5 April 2011). Government Formation. Taylor & Francis. p. 147. ISBN 978-1-134-23972-6. Retrieved 17 August 2012. ^ Jochen Clasen; Daniel Clegg (27 October 2011). Regulating the Risk of Unemployment: National Adaptations to Post-Industrial Labour Markets in Europe. Oxford University Press. p. 76. ISBN 978-0-19-959229-6. Retrieved 17 August 2012. ^ David Broughton (4 January 1999). Changing Party Systems in Western Europe. Continuum International Publishing Group. p. 178. ISBN 978-1-85567-328-1. Retrieved 20 August 2012. ^ Thomas Poguntke; Paul Webb (21 June 2007). The Presidentialization of Politics: A Comparative Study of Modern Democracies. Oxford University Press. p. 158. ISBN 978-0-19-921849-3. Retrieved 24 August 2012. ^ T. Banchoff (28 June 1999). Legitimacy and the European Union. Taylor & Francis. p. 123. ISBN 978-0-415-18188-4. Retrieved 26 August 2012. ^ "Website Info for vvd.nl". Who.is. Archived from the original on 2014-05-15. Retrieved 17 March 2017. ^ Bruno Waterfield (23 April 2012). "Dutch prime minister Mark Rutte resigns over austerity measures". The Daily Telegraph. Retrieved 3 March 2015. ^ "Partij van de Vrijheid (PvdV) - Parlement & Politiek". parlement.com. ^ "Liberale Staatspartij 'De Vrijheidsbond' (LSP) - Parlement & Politiek". parlement.com. ^ "Liberale Unie - Parlement & Politiek". parlement.com. ^ "Rutte: "Het karwei begint nu pas"". NOS Nieuws. 4 November 2006. Archived from the original on 29 May 2007. ^ "Wiegel leest Rutte en Verdonk de les". trouw.nl. ^ "Verdonk wil onderzoek naar leiderschap VVD" (in Dutch). Elsevier. 28 November 2006. Archived from the original on 30 September 2007. ^ "Verdonk haalt bakzeil over leiderschap VVD" (in Dutch). Elsevier. 29 November 2006. Archived from the original on 27 September 2007. ^ "Rutte pleased with committee report". Expatica. 13 June 2007. Retrieved 15 June 2007. ^ "Ex-minister Verdonk expelled from parliamentary party". Radio Netherlands. 13 September 2007. Retrieved 13 September 2007. ^ "Verdonk zegt lidmaatschap VVD op". Nu.nl. 15 October 2007. Archived from the original on 16 October 2007. ^ "Politieke Barometer week 42–19 oktober 2007". Interview-NSS. 19 October 2007. Archived from the original on 27 October 2007. ^ "Politieke Barometer week 43–26 oktober 2007". Interview-NSS. 26 October 2007. Archived from the original on 27 October 2007. ^ "Nieuw Haags Peil van 21 oktober 2007". Peil.nl. 26 October 2007. ^ "Hele hoofdbestuur VVD stapt op". Nu.nl. 21 November 2007. Retrieved 21 November 2007. ^ "Wiegel wants VVD executive to resign". Expatica. 21 November 2007. Retrieved 21 November 2007. ^ "Little support for Wiegel's ideas for VVD". Expatica. 22 November 2007. Retrieved 23 November 2007. ^ "Dutch government unravels over Brussels budget rules". EUobserver. 22 April 2012. Retrieved 23 April 2012. ^ Kiesraad. "Kerngegevens Tweede Kamerverkiezing 2017". www.kiesraad.nl. ^ "People's Party for Freedom and Democracy (VVD) – Netherlands – Full Members – Members – Liberalism". Liberal-international.org. Archived from the original on 6 October 2009. Retrieved 13 June 2010. ^ "VVD News – EU Politics Today". Eupolitics.einnews.com. 9 June 2010. Retrieved 13 June 2010. ^ "Dutch Liberal Party forms-People's party for Freedom and Democracy (VVD) January 24 in History". Brainyhistory.com. 24 January 1948. Retrieved 13 June 2010. ^ a b c d e f g h i j k l m n o p q r s t u v "VVD Standpunten". VVD. ^ "VVD's Official page - Liberale Beginselen". ^ "Mark Rutte: Ik ben ongelooflijk blij". Elsevier. Archived from the original on 2 April 2012. ^ a b "VVD's official page: Liberal Manifesto". ^ (in Dutch) "Dit zijn de 24 mannen en vrouwen van Rutte III". NOS. 26 October 2017. Retrieved 15 January 2018. ^ (in Dutch) "Nieuwe minister van Buitenlandse Zaken Blok beëdigd". NOS. 7 March 2018. Retrieved 7 March 2018. ^ (in Dutch) "VVD'er Eric Wiebes moet economische groei gaan combineren met Parijsdoelen". NOS. 23 October 2017. Retrieved 31 January 2018. ^ (in Dutch) "Minister Cora van Nieuwenhuizen (VVD) heeft alle bestuurslagen gehad". NOS. 21 October 2017. Retrieved 10 January 2018. ^ (in Dutch) "Sander Dekker (VVD) van het onderwijs naar het recht". NOS. 23 October 2017. Retrieved 3 February 2018. ^ (in Dutch) "UWV-voorzitter Bruno Bruins wordt minister voor Medische Zorg". NOS. 24 October 2017. Retrieved 3 February 2018. ^ (in Dutch) "Mark Harbers (VVD), wethouder Rotterdam in roerige periode". NOS. 24 October 2017. Retrieved 3 February 2018. ^ (in Dutch) "Barbara Visser (VVD) moet problemen op Defensie gaan oplossen". NOS. 24 October 2017. Retrieved 3 February 2018. ^ (in Dutch) "Staatssecretaris Tamara van Ark hield de VVD-fractie bij elkaar". NOS. 23 October 2017. Retrieved 3 February 2018. ^ (in Dutch) "Van 't Wout uit Hoeven vice-fractievoorzitter VVD". BN DeStem. 26 October 2017. Retrieved 3 February 2018. ^ (in Dutch) "Ockje Tellegen nieuwe eerste ondervoorzitter Tweede Kamer". Parlement & Politiek. 31 October 2017. Retrieved 3 February 2018. ^ a b c d e f g h i j k l "Politiek leider van een partij". Parlement&Politiek. Retrieved 2012-11-03. ^ (in Dutch) "Keizer treedt af als VVD-voorzitter". NOS. 18 May 2017. Retrieved 19 July 2017. ^ (in Dutch) "Eric Wetzels wordt waarnemend partijvoorzitter VVD". Algemeen Dagblad. 3 May 2017. Retrieved 19 July 2017. ^ "Hermans treedt na Meavita-debacle af als senator VVD" (in Dutch). Algemeen Dagblad. 2 November 2015. Retrieved 21 November 2015. ^ "Annemarie Jorritsma nieuwe fractievoorzitter VVD in Senaat" (in Dutch). Parlement.com. 24 November 2015. Retrieved 8 December 2015. ^ "Halbe Zijlstra nieuwe fractievoorzitter VVD". RTL Nieuws (in Dutch). 31 October 2012. Retrieved 10 October 2016. ^ (in Dutch) "Rutte als Kamerlid die premier Rutte aan de tand voelt? Het kan in demissionair kabinet". Volkskrant. 22 March 2017. Retrieved 20 July 2017. Wikimedia Commons has media related to People's Party for Freedom and Democracy.